So you are ready to make that final leap to financial control and purchase your own financial calculator! You want something that can efficiently calculate mortgages, notes, investments, and loans with ease – well, there are plenty to choose from. 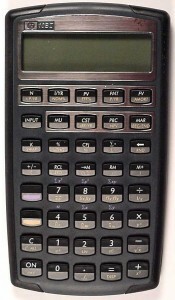 Many calculators can handle financial functions and some are much easier to operate than others. Here are the top three used in our industry. If you want to avoid the technical stuff just skip to the bottom and discover what we use personally! Clearly the industry’s front-runner, the HP12C was THE standard for anyone in real estate for years and can still be found in most investors’ desks. The HP12C is very powerful but comes with some initial challenges. You may have noticed that it does not have an “equal” sign. The HP uses Reverse Polish notation so 1+1=2 would be calculated as 1 [enter] 1[+] (then you get the answer of “2”). The catch here is that if you don’t already know how to use one, it may be worth skipping on to the next model. The newest model has six times faster speeds for calculating TVM, loan payments, interest rates, standard deviation and more. Work more efficiently with memory for up to 80 cash flows. Ideal for real estate, finance, accounting, economics and business work. The HP 12C Platinum Financial Calculator is a classic! There are also HP12C apps available for your tablet, smart phone, or laptop. 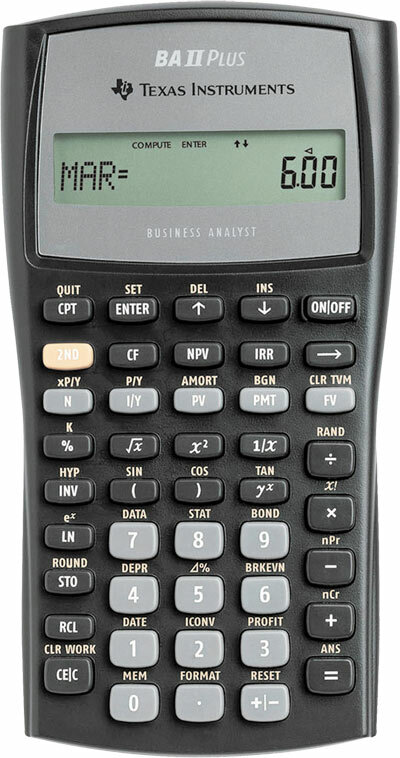 Probably the most basic of the financial calculators, the HP10B (now the HP10B-II) or the TI BA-II Plus will get the job done. 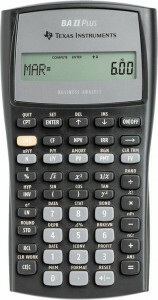 Created in competitive nature, both deliver the basic needs of a financial calculator. Along with the standard capabilities of time-value-of-money, accrued interest, amortization, cost-sell-margin, and depreciation, users will calculate more advanced business and finance related issues. If you are wondering what exactly the “plus” buys you in the TI BA II Plus model, you have to look pretty close (initially the only extra things found were keystrokes). The BAII Plus does allow differing compounding periods to payment periods. You can even calculate bonds to call as well as yield. 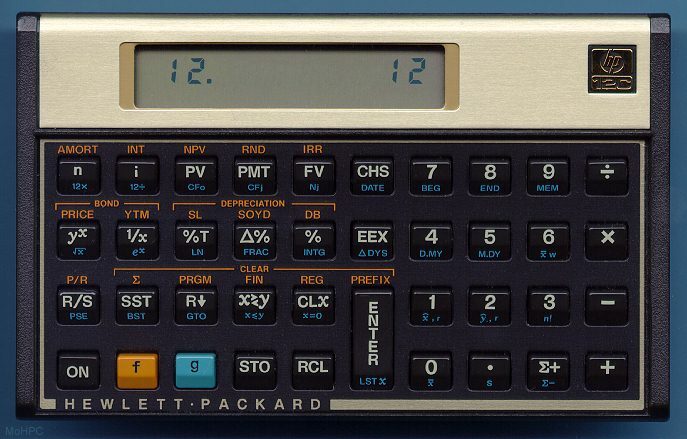 With that said, for basic workhorse calculators, you can’t go wrong with either the Texas Instruments BA II Plus Professional Financial Calculator or the HP 10bII Financial Calculator . This out of production calculator is still a favorite and worth keeping an eye out for at local garage sales and eBay. 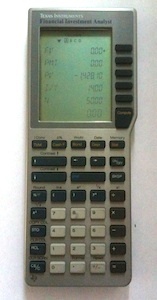 In addition to great speed, the TIFI has a large screen that is capable of holding up to four different calculations simultaneously (Column A, B, C, and D). Additionally, the TIFI can easily amortize any cash flow and give you the balance at any given point in time. So, what calculator do we use personally? Well Tracy always grabs the HP12C while I prefer the TIFI (yes a house divided). In the How To Calculate Cash Flows Training we demonstrate the keystrokes on an HP12C and the TValue Amortization Software. Looking for more info on Calculating Cash Flow Notes? You can also get step-by-step video tutorials in our new How To Calculate Cash Flows Online Training! My vote goes to the HP10B-II. It’s very affordable, uses algebraic notation (even though I also like Reverse Polish Notation RPN), and comes with an excellent owner’s manual that thoroughly explains all of the functions with clear examples. 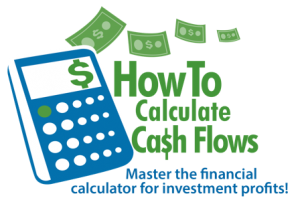 One of the most important features to demand on a financial calculator is the ability to show cash flowing out as negative and cash flowing in as positive. In the note business, cash can flow in either direction when calculating yields and pay-offs. An ordinary loan calculator won’t understand how to calculate partial purchases, like an initial lump sum (negative) and further monthly payments to the note seller (negative) followed by a positive balloon payment (future value). The HP10B-II uses positive/negative signs to show the direction of cash flow, which is critical to valuing a structured partial purchase. Two cents worth, your mileage may vary. I’m a die hard HP10B-II advocate. As a Note investor/broker, I’m able to crank out quick value calculations on amortizations or balloons. With a little more study, you can work complex notes with changes in rate and payment schedules. It’s a great tool, especially for the low price. I highly recommend it to anyone needing to assess the time-value of money.